I had several odd jobs during my high school years. I’ve fought the madness that is my local fair by working the ticket booth at the entry gate. The fair only lasted a few days but the shifts were long and I handled so much money that I would actually dream about counting out change. And dealing with townies was always…interesting. I worked at a record store, which was unfortunately more Record Town then Empire Records. I was working for The Man, not fighting him. Polo shirts and black slacks were involved. Not my best look. But, the icing on the cake was the tiny coffee shop I worked at while I was trying to save money for a Paris trip, junior year of high school . It was run by this mean cat lady who owned the place. Usually, on the weekends, it was just me and her. She would plop herself on this stool and watch everything I did, only getting up to yell at me/fix something I did. And I ALWAYS wrapped the wraps wrong. They were to tight. Too lose. Too much filling. Not enough. On more then one occasion she would trash what I had done and start over. So needless to say, I have a mental block about making wraps and burritos. Seriously, I can never get them right. My brain refuses. Filling is always spilling out and the ends never stayed tucked in. 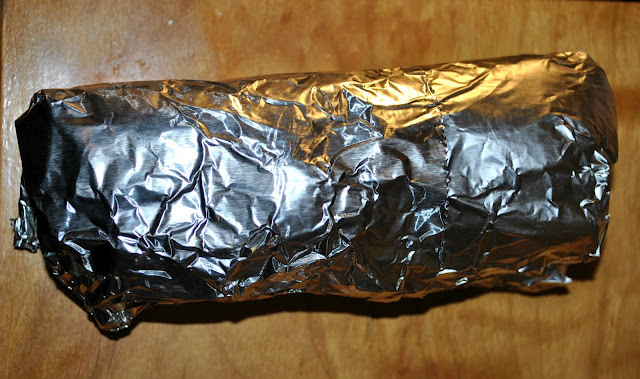 This became glaringly obvious this week when I tried to make burritos for lunch. I tried to 3 days in a row before cursing furiously, plopping everything in a bowl and eating it like that. And guess what, it tasted just as good! Too bad I couldn’t have done that at my job. I’m pretty sure mean cat lady would have had an aneurism if I even attempted it. Add one cup of quinoa and two cups of water to a medium sauce pan. Bring to boil. Reduce to a simmer, cover and cook for 15 minutes. After 15 minutes, when all the water is absorbed, remove from heat and fluff with a fork. Stir in the black beans. Meanwhile, slice up the pepper, the onion and the tofu to your liking (I cut mine my veggies long strips like fajitas and my tofu in cubes ). 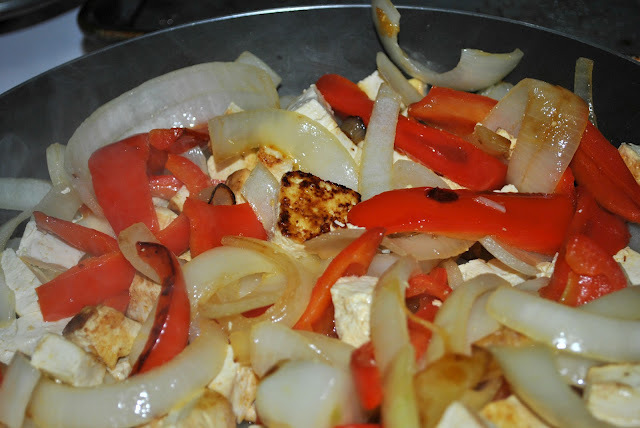 Heat the olive oil to the pan and then add the veggies and the tofu. Saute until the tofu is golden brown on the outside. The onions with me soft and the peppers should still be a bit crunchy. Add the taco seasoning and water to the veggie/tofu mix and stir until the seasoning thickens to a sauce. It should only take about 2 minutes or so. Scoop quinoa/bean mix onto a wrap. 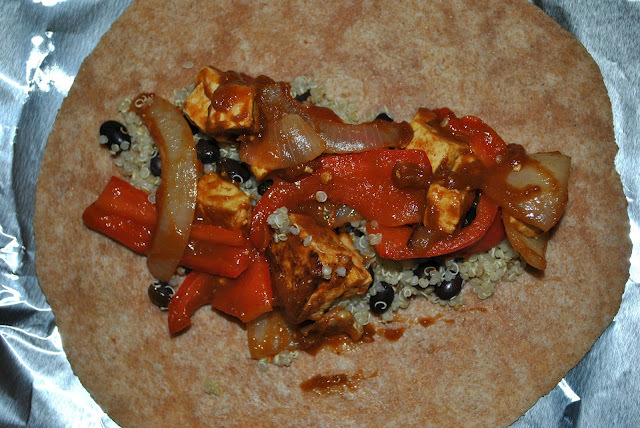 Add veggies and tofu and any additional toppings you like. Alternatively, if you can’t keep your wrap together (like me) and it all falls apart by the time you get it to work the next day, you can mix everything together in a bowl. My favorite combo so far has been: quinoa, beans, veggies and tofu with taco seasoning, half an avocado cut into cubes, and a little BBQ hot sauce (yes…even my hot sauce is BBQ flavored). I keep the wrap on the side, slice it in triangles before work and then toast them at works as sort of a make shift tortilla chips. aww…look how compact it is. Too bad as soon as I unwrapped it at work, the whole thing fell apart. Grr. It’s really easy, full of protein and keeps you full for the rest of the afternoon. Win, win and win! Mmm looks good! 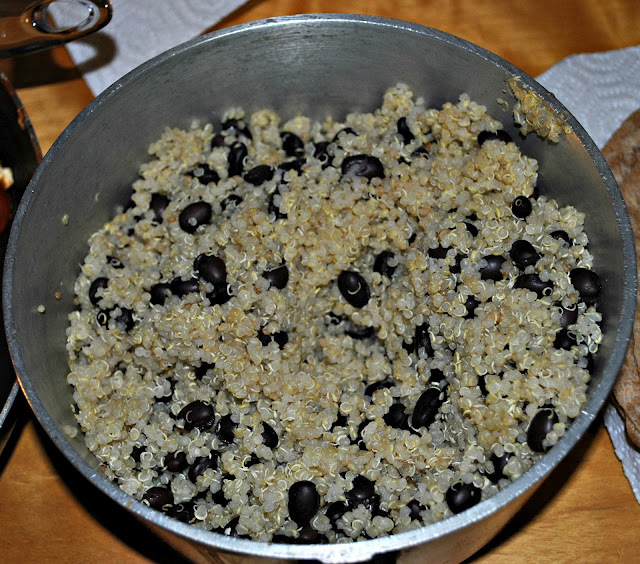 Going to try cooking the quinoa with the taco seasoning this weekend and adding black beans and canned corn. Nom!